Melva Routenberg of Campbellsville, daughter of the late Raymond Wood and Minnie Hale Wood, was born in Taylor County, Kentucky. 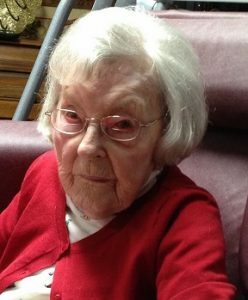 She died at 7:10 P.M., Wednesday, April 3, 2019 in Campbellsville. She was a member of the Temple. Melva was the retired owner and operator of the State Beauty College in Campbellsville and the Somerset Beauty College. She united in marriage to Herman Routenberg January 16, 1966 and he preceded her in death August 5, 1989. She is survived by two step-sons, David Routenberg of Virginia and Victor Routenberg of Florida; four step-grandchildren; several nieces and nephews and many other relatives and friends. She was also preceded in death by one step-daughter, Alicia Routenberg Jensen and three brothers: David Wood, Noel E. Wood, Ethra Wood and Dossie Morris Wood. Burial was at Temple Cemetery in Louisville, Kentucky.